1. Preheat oven to 450 degrees F. Lightly spray a baking sheet with olive oil cooking spray; set aside. 2. In a medium mixing bowl combine pizza crust, Cajun seasoning, and hot water until well moistened. Beat 20 times to form a dough. 3. Let sit while you make the sauce. 4. In small mixing bowl, combine tomato sauce, hot sauce, and garlic; set aside. Press dough into a 12-inch circle on a baking sheet with floured fingers. Spread sauce onto dough evenly, leaving a 1-inch border. 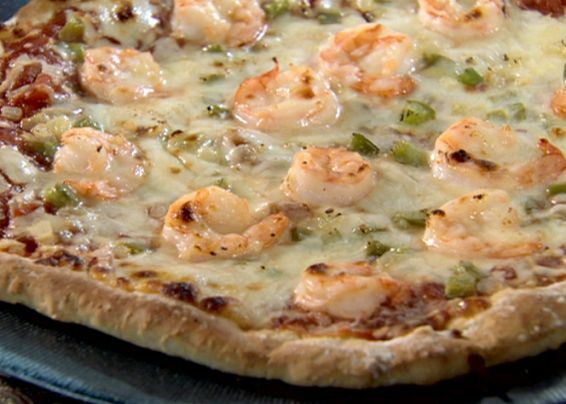 Top with cheese, peppers, onions, and shrimp. 5. Bake in preheated oven 12 to 17 minutes or until crust is golden brown.